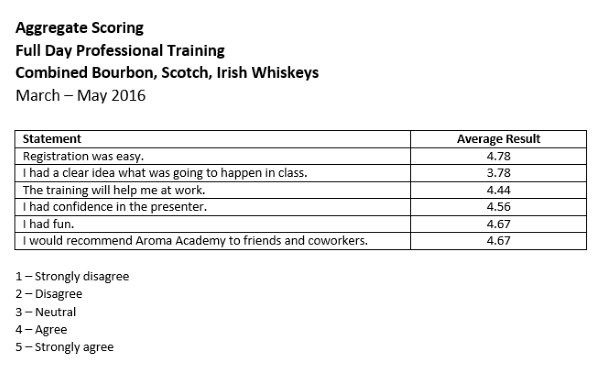 Bourbon Archives - Aroma Academy U.S. They pour the Bourbon sample too early – 95% of what you perceive as flavor is really aroma. The aroma of a fine whiskey is the product of hundreds of different compounds, each evaporating at its own rate. The volatile compounds that evaporate most quickly include delightful fruit and floral aromas that most people never smell because, by the time they get around to it, the aromas are gone. What’s left are the spicy mid-notes and the base aromas most people associate with Bourbon: wood, caramel, vanilla, cooked sugars, earth, smoke. If you must pour ahead, cover the glass so air exposure is minimal. Only uncover the glass when you’re ready to sniff. They inhale too deeply – the goal of sniffing is to let aroma molecules linger over the olfactory epithelium, which is pressed up against the bottom of your brain at the top of the nasal cavity. If you take a big, long whiff, you’re blowing a numbing overdose of aroma molecules past your smell receptors. Instead, sniff like a dog: a series of short, gentle inhalations, allowing each to linger a fraction of a second in the sinuses before the next replaces it. Do five little inhales and then exhale through your mouth. They don’t reset their noses – After a few whiskey samples, you’re brain starts to think the whole world smells like whiskey, and starts to block out some of the common aromas. There are those who advocate coffee beans to clear their noses; we don’t. Instead, to reset your nose smell yourself – your arm above the wrist is the most socially acceptable option. A couple of deep breaths will clear your olfactory receptors and remind your brain that whiskey is not a background smell that needs to be filtered out. They smell the spirit only out of a glass – Nothing improves your enjoyment of whiskey like good glassware. Glasses like the Glencairn glass, with wide bowls and narrow openings, concentrate and preserve whiskey aromas. They also concentrate evaporating alcohol, which can overwhelm whiskey’s more subtle aromas. Nosing the whiskey off a perfumer strip rather than out of a glass can add dimensions to your perception. Perfumer’s strips are scent-neutral paper that retains aromas while letting those aromas evolve naturally. Dip that paper into the whiskey, and then sniff the strip over the next few minutes. This gives you a slightly different perspective on what’s in the glass, and can help confirm and focus your earlier observations. Take breaks – Depending on the aromatic profile of what you’re sampling, your nose is at its best for only three to six whiskies. After that, it’s harder to detect some of the subtle aromatic notes. So: take a little break. Walk outside or into a different room; inhale deeply. Give yourself a few minutes and then back to it. All of this said, don’t over-complicate your enjoyment of whiskey. Incorporate intelligent sniffing techniques without obsessing, and learn to match your assessment ritual to your context. Be more careful at an organized tasting, but don’t get carried away when you’re just having a drink with friends. They might find it off-putting if you start sniffing like a dog and smelling yourself over the appetizer. 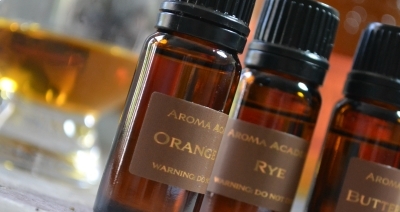 Buy the Aromas of Bourbon training kit and become a Bourbon ninja. When it gets hot in the summer things slow down, and we have time to collate data. We’re sure you do the same thing. Anyway, last week over light cocktails we did the math and discovered that the people who’ve been through our training really like it. This is not the kind of data we usually share, but the feedback is so good it’s worth breaking our own rules. We asked about 100 participants to rate certain statements from 1 (strongly disagree) to 5 (strongly agree). Then we turned them all into averages to see how we were doing. Here’s how we did. The one we watch most closely is the third: “The training will help me at work”. Professional training is our bread and butter, and if participants in those sessions aren’t happy, we aren’t happy. The average score was 4.44, which is good enough to make us happy. But what makes us really, really happy is that not a single person disagreed with that statement,. Every single bartender, distributor, server, and retailer who has been through our professional training thought it would help them in their work. The other thing that stands out in this data is that people didn’t have a real strong idea of what it was they had signed up for. It makes us curious why they signed up, but we’ll leave that for the next survey. For now, we’ll work harder to clarify what people should expect when they sit down with us, starting with a revision of our “we help you smell better” value proposition. Apparently, there’s more than one way to take it. We’ll let you know when we come up with something. With lines forming for the new Pappy release and bottles hiding beneath counters for most-favored customers, we thought we’d point something out: We can recreate the nose of Pappy using our aroma strips. We know: it’s not the same thing. But it’s kind of cool anyway. Here’s the recipe: dip two vanilla strips and one each of oak, leather, brown spice, maple, and the earthy aroma. Some would argue there needs to be a floral element, too, so go wild — though maybe not dip the strip all the way into the floral essence. Half-a-dip will do. Let the strips air out for a few seconds so the alcohol evaporates, and then wave them a few inches beneath your nose. Inhale short, sharp breaths. There it is, the essence of Pappy without any of the fun. And the downside is the aromas will get your mouth watering, but there’s no actual Pappy to drink.